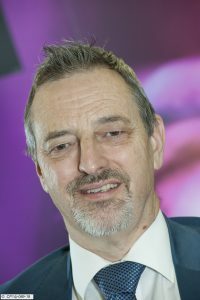 Tony Donné is involved in fusion research since 1985. Since June 2014 he is Programme Manager (CEO) of EUROfusion, the consortium coordinating the R&D in the field of fusion science and technology in Europe and which is additionally responsible for the (pre-)conceptual design of the DEMO device. Until June 2014 he worked at the Dutch Institute for Fundamental Energy Research; from 2009 – 2014 as Head of the Fusion Research Division. Tony was director of the Dutch-Russian ‘’Center of Excellence on Fusion Physics and Technology’’and programme director of the ITER-NL consortium. He is professor at Eindhoven University of Technology in Diagnostics and Heating of Fusion Plasmas. A substantial part of his scientific career was devoted to the design and use of plasma diagnostics at various fusion devices. He coordinated during 10 years the international activities in the field of diagnostics for ITER.